CARLOW HIT THE last five scores of the game to claim victory over Kerry in the Joe McDonagh Cup opening round at Dr Cullen Park. Carlow are without key forward Martin Kavanagh who is spending the summer in the US. In his absence, Denis Murphy fired over 0-5, Edward Byrne contributed 0-4 and James Doyle hit 0-3 in the victory. The Division 2A champions led by a 0-10 to 0-9 at half-time but Kerry found themselves two points in front after 65 minutes with Padraig Boyle and Shane Conway influential up front. Carlow’s experience told down the stretch with Byrne, Kevin McDonald and Jack Kavanagh on target as Colm Bonnar’s side sealed the win. 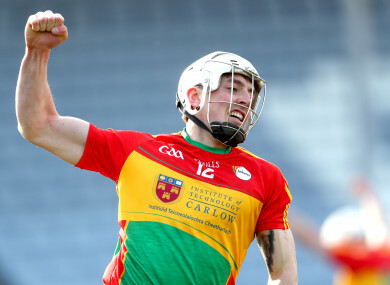 Email “Carlow finish strong with last five scores to see off Kerry in Joe McDonagh opener”. Feedback on “Carlow finish strong with last five scores to see off Kerry in Joe McDonagh opener”.